The rest of the country celebrated Christmas Day on 25th December, but there's one part of the UK that is celebrating it today. It is Britain's remotest permanently inhabited island with a population of just over 30 people. The island called Foula in Shetland will finally celebrate Christmas today. They will also see in the New Year nearly two weeks after the rest of the world. The community has a strong Norse tradition of folklore, music and special festivities. Scotland took on the Gregorian calendar in 1752, with the rest of the UK, but Foula stuck with the Julian one. This means Foula is 12 days behind putting Yule aka Christmas on January 6 instead of December 25 and Newerday aka New Year on January 13 instead of January 1. Islanders will gather in one house to celebrate Christmas today where they will exchange gifts and greetings. The islanders include ten children - who have been patiently waiting for Santa Claus. "Islanders have celebrated these days before the Greorgian Calendar," said crofter Stuart Taylor, 44. "It is not just part of our tradition - but the world's. It is everybody else who changed - not us. "We are not unique - other parts of the world, such as areas of Russia, still celebrate the old calendar. "On the 6th, families open their presents in their own homes and then in the evening we all tend to end up in one house. It is the same at New Year on the 13th - we will visit each others' houses and end up at one. "This tradition is not going to end here. The children have been brought up to expect their main presents on the 6th." Where is the island and what do we know about it? The island is three and a half miles long by two and a half miles wide. 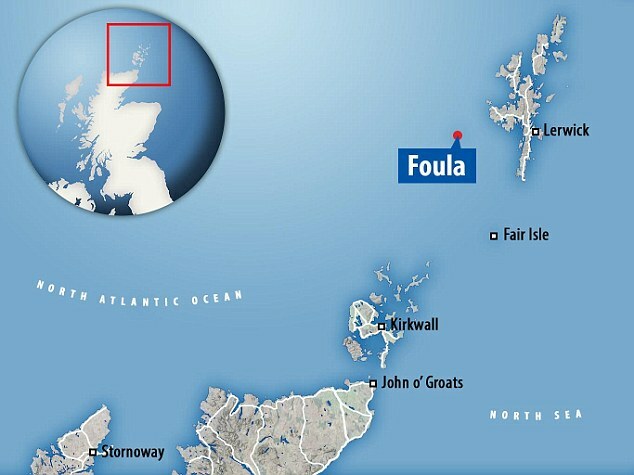 At one point, Foula - which lies 15 miles west of mainland Shetland and 100 miles north of mainland Scotland, on the same latitude as southern Greenland - sustained 287 people. Foula got running water in 1982 and full electricity by 1984, supplied by a diesel generator. It currently has a renewable energy system - mainly photo voltaic - backed up by diesel. The small community has kept its strong Norse traditions and its inhabitants were the last to speak Norn, a form of old Norse which died out around 1800. "We have virtually 24 hour electricity now. It rarely goes off and when it does only for a short time," added Mr Taylor. "We have everything here - all the mod cons, the internet and TV. We are very self-contained. "We have had some scary weather lately with the storms. Some car windows were smashed by stones picked up by the winds. But it is winter and we had a really good summer." The isle is so remote and prone to the weather that attempts by previous Church of Scotland minister, the Rev. Tom Macintyre, to reach it for one Christmas service had to be abandoned after three attempts. On Foula, Mr Macintyre carried out one wedding - when he married Amy and Wullie Ratter in their croft garden - one funeral, where mourners had to walk a mile from the church to the cemetery and, sadly, no baptisms in his five years in charge. Mr Macintyre said he usually left Foula with gifts of lamb and home baking. By special arrangement of the CoS General Assembly, Foula is required to have six visits per year. Foula - meaning "bird island" in old Norse - was the location for the film The Edge of the World. The RMS Oceanic was wrecked on the nearby Shaalds of Foula. The rest of Great Britain adopted the Gregorian calendar in 1752, but Foula stuck with the old Julian calendar. The change was made because the Gregorian had a 0.002 per cent correction on the length of the year. The change switched Foula's calendar 13 days behind the rest of Britain, though this moved up to 12 when the island didn't have a leap year in 1900. For that reason December 25 becomes January 6 in the Foula calender. Last edited by Blackleaf; Jan 6th, 2019 at 11:25 AM..
Foula ... Where everyone is a cousin, including their sheep. I don't live on an island like you do, bro. Our gene pool is much broader, here. It has around five times Canada's population on a land mass that's somewhat larger than that of Vanvouver Island. Well, no. They are an insular bunch. Canadians come from every point on the compass. Last I lived on Vancouver Island, I found the gene pool quite varied between English, French, indigenous Canadians, Japanese, Iranians, Arabs, and many others. Have you never visited Vancouver Island? Well, yes and the natives there are an insular bunch even more inbred than the British. The others just turned up yesterday. Really? If the indigenous peoples of the Pacific Northwest were so insular, then why did they create Chinuk Wawa as an international auxiliary language stretching from the Northern tip of what is today california to the southern tip of what is today Alaska and stretching as far inland as Oregon? And if they were so insular, how do we explain why Chinuk Wawa adopted words not only from the local indigenous languages but also from Cree, ojibwa, English, French, Hawaiian, Russian, Spanish, and even Chinese? Doesn't seem too insular to me. The insular, indigenous British spread their labgiage all over the planet and it is currently the lingua Franca of the world. Hmmm... good point. But the British, too lazy to learn another language, just imposed their language on the rest. The indigenous peoples of the pacific Northwest created a common second language. Kind of smart, those indjuns, if you ask me. Why do islands have a narrower gene pool? I can't work it out. The British Isles consists of two countries: the UK and Ireland. Officially, the UK has a population of 66.57 million (though I reckon it's actually more than that) and Ireland 4.8 million. Canada's population is 37 million (Canada is the same size as Europe - not the EU but the whole of Europe - and, for comparison, Europe's population is 741 million). Great Britain - the largest island in the UK and Europe and the eighth largest in the world - is four times the size of Vancouver Island. The UK as whole is the same size as Michigan. Last edited by Blackleaf; Jan 8th, 2019 at 06:20 PM.. There are 1.3 billion Han Chinese and they are one of the least genetically diverse populations on Earth. Are you serious? They often intermarry with Manchurians, Koreans, Russians, Uighurs, Kazakhs, Zhuong, and many others. Make more wine, a lot more wine and promote celebrations at the marriage and the divorce. The Chinese leaders haven't been as enthusiastic about immigration and multiculturalism as Western leaders are. They once built a wall to keep neighbours out. Hmmm... I have a feeling that you mean that tongue-in-cheek. If you have ever visited much of China, you'll notice some Chinese who look practically European. And yes, they are Chinese, usually of Uighur, Kazakh, or Russian descent. Then you'll find some Chinese with a reddish complexion. I've also met Chinese who spoke with a Korean accent. And no, they were not immigrants from Korea but rather Korean Chinese usually from the Yanbian area. When I'd visited urumqi, I'd met Han chinese who had kazakh friends. I'd not actually come across any mixed-race Chinese as far as I know other than married to actual foreigners (though that mixes the gene pool too), but I've still heard from Chinese friends that they had met mixed-race Chinese between different ethnic groups too. So where do you come up with the idea that the Chinese are all inbred? Last edited by White_Unifier; Jan 9th, 2019 at 12:14 PM..
Do you realize just how diverse China is already? That said, I do agree that the PRC governent has expressed somewhat xenophobic sentiments in the past, or at least from what I'd heard from Chinese friends in China. You can't take that as representative of the Chinese people though especially when you consider that China is a one-party state. Why is is that I never see a homeless Chinese person on our streets? The Chinese welfare system is called the family. If you need help, you move in and the family will take you in. That said, there are plenty of homeless Chinese, but of course they're not the ones emigrating abroad. There are plenty of homeless EU citizens on our streets. I specified Han Chinese, not Manchu, Uyghur, Tibetan , etc. But the Han intermarry with them. Do Han interbreed? I'm sure some might be just like Blackleaf, but not all. Explain the Mexican stand off Japanese, Chinese and half-breed Koreans. Well, the Han crushed them, anyway. To the victor go the spoils, eh? There you go, they're not inbreeders. Relatively speaking, they are. China is like a great island with impassable deserts to the West and the sea to the East. Medicare Celebrates 50 years today.